Tapioca flour, or tapioca starch, comes from the cassava plant. 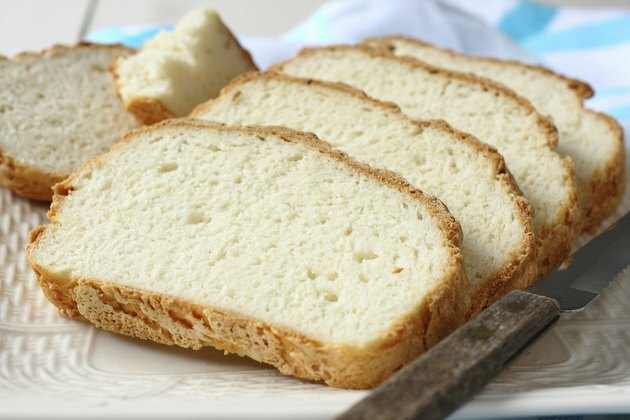 This gluten-free starch can help improve the flavor and texture of gluten-free baked goods. Gluten is responsible for building the structure of breads and other baked goods, giving these foods a characteristic chewy texture. Tapioca flour can help add body to your gluten-free recipes, making them feel like more traditional recipes. For most of your baking needs, you can create a gluten-free all-purpose flour blend containing tapioca flour. Combine 1 part tapioca flour, 2 parts potato starch and 6 parts brown rice flour. When using this flour in traditional recipes, substitute an equal amount of the gluten-free blend for the amount of all-purpose flour. If you are making gluten-free bread, mix together 3 parts millet and 3 parts sorghum with 2 parts each of potato starch, cornstarch and tapioca flour. For variety, you can replace some of the millet or sorghum with oats, quinoa flour or teff flour. For a more delicate cake flour, combine approximately equal amounts of white rice flour, potato starch and tapioca flour. Add a bit more of the rice flour and the potato starch. Use this blend to replace equal amounts of cake flour called for in traditional recipes. Because much of gluten-free baking is an art, not a science, you can experiment with the proportions in these blends until you achieve your ideal texture. Tapioca flour adds a bit of springiness to your baked goods. If the texture of your baked goods is too springy, reduce the amount of tapioca flour slightly. Additionally, if you are converting a traditional recipe to a gluten-free recipe containing tapioca flour, you will need to decrease the amount of liquid slightly because wheat flour is more absorbent than gluten-free flours are. Gluten-Free Baking With the Culinary Institute of America; Richard J. Coppedge et al. Is Semolina Flour Gluten Free?